Following his departure from Deep Purple in September 2002, Jon started 2003 with a vengeance, with a visit to Australia. A full spectrum of his music was performed, setting up a number of interchangeable templates for his solo career. There were performances of the Concerto for Group & Orchestra in January and February, and the world premiere of Jon's new orchestral work "Boom Of The TIngling Strings". Plans for band / orchestral performances of Jon's solo work had to be shelved after he hurt a hand. He didn't feel that he could handle the required piano work for the shows, but could still manage the Hammond OK. So, at very short notice, he joined ex-Rainbow bassist Bob Daisley's band The Hoochie Coochie Men for a few R&B shows. The Hoochie Coochie Men were formed in the late 1990's when Daisley joined his old Kahvas Jute band mate Tim Gaze's band The Blues Doctors, and suggested a fresh start with a new name. Their eponymous first album was released in 2000, but the band had become dormant before getting together with Jon Lord for four shows and a live TV appearance in February 2003. Their gig at The Basement club in Sydney on 7th February was recorded for DVD / CD release. Australian singer Jimmy Barnes (who had apparently been in the frame to join Deep Purple back in 1989) guested on vocals for the occasion, and also took part in the final show at Coolum. The band put together a second studio album in Australia during 2005. Jon added keyboards in 2006, along with guests vocalists Jeff Duff, Ian Gillan and Jimmy Barnes. The resulting album was released the same year as "Danger, White Men Dancing". 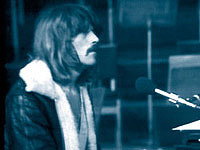 Jon Lord's first full work for group and orchestra was premiered at the Royal Albert Hall, London, on 24th September 1969 with Deep Purple and the Royal Philharmonic Orchestra. The performance was recorded and filmed, released as a live album in December 1969 and on VHS in the 1980s. Despite landing Deep Purple in the UK's top thirty album chart for the first time, the piece was only performed live on one more occasion by the Nk2 version of the band, and became viewed as a one-off anomaly in the band's catalogue. Its follow-up "The Gemini Suite" received only one live performance involving Deep Purple, in September 1970. The ecording was released on CD in 1993 by RPM Records (and later reissued by Purple Records). The Concerto's original score was lost, which ruled out future performances until Dutch composer Marco de Goeij took on the monumental task of transcribing it from the 1969 recording. The score was finished with the help of Jon Lord, and the work was brought back to life at the Royal Albert Hall, London, on 25th/26th September 1999 with two hugely successful performances by Deep Purple with the London Symphony Orchestra conducted by Paul Mann. The shows were recorded and released on CD / DVD. The Concerto was then toured by Deep Purple in 2000-2001, accompanied by different orchestras. The first performances without Deep Purple took place in Australia in February 2002, when Paul Mann conducted two nights with Australian band george (with a small "g") taking the band role. Further performances in January and February 2003 included Jon on Hammond. The next appearance of the Concerto was at the Henley Festival on 7th July 2006, with the Bournemouth Symphony Orchestra and an "all star rock band" featuring Jon on keyboards, plus session players Philip Niessen: lead guitar, Urs Fuchs: bass guitar, Wolf Simon: drums, Mario Argandona: percussion and Mascha Elstner: vocals. On 7th October 2007 Jon, Roger Glover, Paul Mann and the Royal Philharmonic Orchestra performed it at the Malcolm Arnold Festival in Northampton. In March 2008 Jon performed the piece over three nights with the Adelaide Symphony Orchestra, and on 26h July 2008 in Poland with the Plock Symphony Orchestra. By 2009 it was turning up frequently on his live itinerary. Vocals were usually handled by Jon's regular band members Kasia Laska and Steve Balsamo, although ex-Rainbow singer Dougie White filled in for Balsamo at a performance in Plovdiv, Bulgaria on 1st September 2009. Jon and the Royal Liverpool Philharmonic Orchestra played the The Concerto at the "Liverpool Classical Summer Pops" on 16th June 2010. This has lead on to the first studio recording of the piece, which is being recorded in 2011 with the Royal Liverpool Philharmonic and various guest musicians from the rock / pop world. Jon's 34 minute piano concerto "Boom Of The Tingling Strings" was born in the late 1990's, inspired by the DH Lawrence poem "Piano". The piece was premiered during Jon's 2003 Australian visit, at the QPAC, Brisbane on 15th February,, with 1999 Concerto conductor Paul Mann at the helm and MIchael Kieran Harvey on piano. (Harvey has also played on Australian premieres of works by Keith Emerson and Frank Zappa). Jon laughingly referred to it as his "revenge on concert pianists" Some of Harvey's rehearsals were caught for the rambling "WIth Pictures" Australian tour DVD, along with five minutes of distant footage of the premiere. Jon Lord did not play on the piece. Harvey and Mann also took part in the European premiere at the Conservatoire de la Ville de Luxembourg in May 2004. "Boom Of The Tingling Strings" was recorded in December 2006, performed by Argentinian pianist Nelson Goerner with the Odense Symfoniorkester under conductor Paul Mann. It was released by EMI classics in 2008, and in 2010 was voted no.79 in Classic FM's "Classical Hall of Fame" top 300. The album was filled out with "Disguises", a suite in three movements, with each a portrait of someone who had inspired Jon; including SIr Malcolm Arnold and his mother Miriam. It was originally performed at the Nidoros Cathedral in Norway on 14th September 2003. On that occasion Jon was joined by old friends MIller Anderson and Sam Brown (both of whom had sung at the 1999 Concerto shows) along with the Trondheim Soloists chamber orchestra. "Song for Miriam" had previously appeared on Jon's "Pictured Within" solo album in 1997, and was also re-worked for Jon's first post-Purple solo album, "Beyond The Notes". "Beyond The Notes" was recorded in June-July 2004 with the sixteen strong Trondheim Soloists, Miller Anderson, Sam Brown, Anni-Frid Lyngstad from Abba, and musicans including drummer Pete York. and bass player Urs Fuchs - who later played at the 2006 Henley Concerto show. The album was released in September 2004, at first only in Germany. 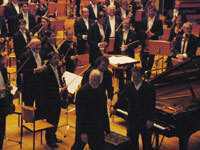 It was due to be followed with a full European tour, however the costs of touring with the chamber orchestra plus a seven-strong band listed as "Jon Lord and the Gemini Orchestra" helped to limit the tour mainly to Germany, with many dates postponed into 2005. One show which did go ahead was the 5th October 2004 show in Cologne's Vulkanhalle, which was quickly released on DVD in December 2004 by Capitol Music / EMI Germany. The DVD was a Germany only release, indeed it was only after an appeal from the DPAS that the "Beyond The Notes" CD received a belated release outside of Germany. "From Darkness To Light" is an orchestral work involving strings and choir. It was first performed back in 2000 in Hambleden and Henley, and was subsequently reworked for its official debut at Hereford Cathedral on 11th May 2007. This was followed by a performance in the Nidaros Cathedral in Trondheim involving vocalist Jorn Lande, who later took part in Heaven & Hell's Ronnie Dio tribute at the 2010 High Voltage Festival in London. "From Darkness To Light" has not been officially released on CD or DVD. Another new piece from the period - "For Example (e.g.)" - was written in homage to composer Edvard Grieg (hence the EG), and was first performed in Trondheim, on 8 January 2008 with the Trondheim Soloists. It was later recorded, and released on Jon's 2010 "To Notice Such Things" album. Jon had been working on the Durham Concerto before his departure from Deep Purple. It was finally recorded with the Royal Liverpool Symphony Orchestra in July 2007 and was Jon's most overtly classical work to date, with Jon contributing Hammond organ work. The studio recording was due to coincide with the world premiere of the piece in Durham Cathedral on 20th October 2007, but missed the deadline and eventually appeared in 2008. The work has been richly acclaimed, and came in at an impressive no.28 in the Classic FM 2010 Hall Of Fame, sandwiched between such company as Faure's "Requiem" (the BBC's 1998 Word Cup theme to some!) and Sibelius' "Finlandia". Those placings also landed Jon at no.3 in the works by living composers. Jon Lord & The Hoochie Coochie Men. Live at The Basement, Sydney, 7 Feb 2003. Now available as 3xCD set with eight bonus tracks - including interviews and rehearsals. Jon Lord. Jon's first solo studio album since "Pictured Within" in 1997. Also available as a 5.1/stereo SACD edition. Jon Lord & The Hoochie Coochie Men. Excellent r&b set. Ian Gillan guests on two tracks. Available as CD, or CD with bonus DVD containing three tracks from the 2003 Basement show plus a documentary. Jon Lord. Recorded with the Odense Symphony Orchestra in December 2006. Jon does not appear on the recordings but did oversee the sessions. Jon Lord. Recorded with the Royal Liverpool Symphony Orchestra in July 2007. Jon plays Hammond on the recording. Jon Lord & The Hoochie Coochie Men. Two hour live DVD from The Basement, Sydney, 7 Feb 2003. Re-released as DVD +CD package. Jon Lord. DVD includes lengthy interviews, on stage performances and rare footage, much of it from Lord's stay in Australia in Jan/Feb 2003. 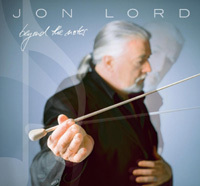 Jon Lord, Beyond The Notes tour live in Koln 2004. 14 tracks. Also includes 25 minute interview with Jon. Germany only release. 16.9 PAL region free, stereo and 5.1 DTS. "A Celebration for Jim Capaldi". Tribute concert recorded in London, January 2007. Jon plays on three tracks. Musicians include Pete Townshend, Paul Weller and Yusuf Islam. Also on CD.